Since 1984, Kerr Brothers Roofing has been installing residential roofs in Canton, Ohio, Stark County, and surrounding areas. Our list of satisfied customers includes home owners and property managers of office buildings, apartments, and condominiums. 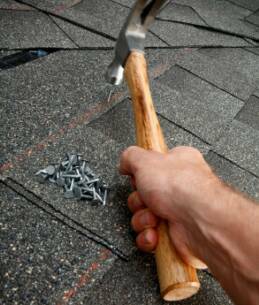 We use superior roofing materials and are dedicated to completing each project in a timely manner with top-notch workmanship. Our thousands of satisfied customers have kept us busy for over 25 years, as most of our work comes by referral. When people are happy with the service we've provided, they tell other people, and the good word spreads: neighbor to neighbor, friend to friend. So you can sleep soundly at night, knowing there's a good roof over your head. Whether you need a new roof, a roof repair, new gutters or gutter cleaning, vinyl siding, replacement windows, or a certified roof inspection, we're happy to answer all your questions and to give you a prompt, free estimate. We're fully licensed, bonded, and insured, and a member of the Better Business Bureau.